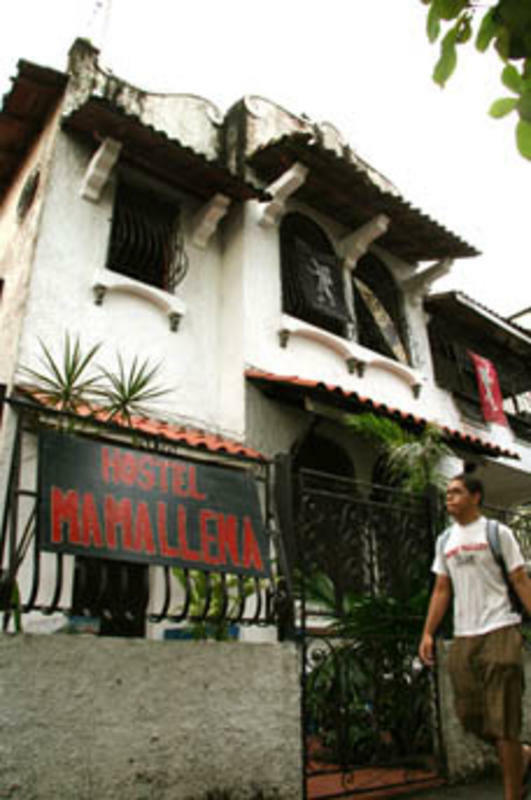 Lonely Planet says Â¨If you`re after a small, intimate hostel, Mamallena should be your top pickÂ¨. Well, we`d say we`re a mid sized hostel, but that means we`re not so big that we can`t provide a personal level of service to all our guests. 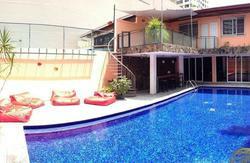 We`ve long been regarded as one of the best hostels in Panama City and we plan on keeping that reputation. We`re travellers like you and we know what you want, that means keeping our service levels high and our prices affordable. We`re not a 24 hour party hostel but that doesn`t mean we`re boring. We try to provide something for everyone, theres a party when you want it but when it`s time for peace and quiet then theres plenty of areas to escape to. Our large back terrace is popular for drinks and socialising, but we also have the lounge area for watching one of our 100`s of movies and the garden where we have hammocks, lounges, a BBQ and huge tables for those group meals. But we`ve kept the sleeping areas away from the social areas. If you want an early night then you won`t be keep awake by those who don`t. We also don`t have any rules, we`re all adults and we know how to act. All we ask is that you`d show the respect to others that you`d expect yourself. We also pride ourselves on the quality of information that we provide. We were the first hostel in Panama City to provide bookings for boats to Colombia and we continue to be the leader in this area. We`ve also got some of the best contacts in the San Blas area and can arrange just about whatever you want down there, whether it`s a 3 day sailing cruise or a budget island stay. 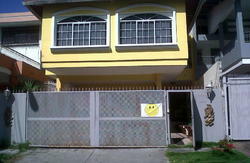 - English speaking staff, Great mattresses ,Free(obviously!!) expert advice, Free all day pancake breakfast, Air conditioning in rooms(at night), Spacious dorm rooms, one with ensuite, Double rooms with shared bathrooms, 24 hr kitchen, Free tea and coffee, free internet access on public computers, Free WiFi internet ,100 movie + DVD Library, Sheets and Pillows(of course), Towels for rent, Honesty System Bar(because we trust you......), 24 hr reception, NO CURFEW, Free Luggage storage for everybody, Coin Operated Laundry, SKYPE, Payphone, Reasonably priced shuttle service, Valuables lockers(Fits laptops and SLR\'s), Hammock Garden and BBQ Area, Booking of Trips and Tours at low prices, FEE FREE, Close to popular bars and clubs, Easy access to all tourist destinations, Information on sailing to Colombia, Homestays in the San Blas Islands, Friendly staff, really!! Close by is everything a backpacker needs, you`re on a budget and out to save money and our area is the place to do it. Close by are a host of budget eating places, local bars and cheap shopping. If you can`t find it here you can`t find it in Panama! 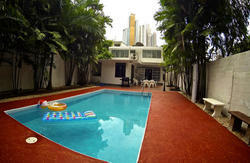 Plus there`s easy access to bus stations and all the major tourist attractions. We say our dorm room has 12 beds, it`s more than likely you`ll get one with 8 beds. Once you have a booking for a dorm bed you`re in for as long as you`d like to stay. Private room stays can be extended depending on availability. But we`ll always help you find another place if we have none. If it shows that we have no availability for a particular date just check with us. There`s a fair chance that we`ll be able to fit you in. If you need any information or advice feel free to email us. And don\'t forget to visit us at Hostel Mamallena in Boquete as well. If you need transport to or from the airport or other shuttle transport, please contact us with your details. They can also drop you opposite the Farmacias Arrocha in Perejil, you'll see a building called 'Govimar', go up that street and we're on the right handside. We also have an airport pickup service from the International airport. It's $30(about the same price as a taxi) for 1-4 people and we'll try and put you together in a group with other people to make it cheaper if we can. Generally only advisable in the daytime. It can take 1-2 hours depending on traffic and costs 25 cents at this stage. It will go all the way along Via Espana. Tell the driver you want 'Farmacias Arrochas en Perejil'. Opposite Arrocha on Via Espania is Govimar, beside it is a Delta gas station. Go up the street that Govimar is on and we're on the right hand side, it is the first white house., the second gate and up the top. To reach the bus, exit the airport terminal and walk to the right, go round the side of the cafe and walk through the car park and up to the main road. Cross the road and wait in the bus shelter for a bus that says 'TOCUMEN-VIA ESPANA' on the front. With your back to the airport terminal the bus will be traveling to your left. It is easy but you may have to ask for some local assistance. Getting to us from Albrook bus terminal(where all buses arrive and depart) is easy, so long as you know where to get off. Jump on to a bus that says VIA ESPANA on the front and tell the driver you want to get off at the 'UNIVERSIDAD LATINA' . From there cross the road, head up to Via Espana and you should come out at 'Farmacia Aroccha' , cross at the pedestrian crossing and walk straight up ,with Govimar on your left,and we will be the white house on the right, second gate and up the top. From the domestic airport follow the same directions as above however first you have to get to the bus terminal! which is $2 taxi.